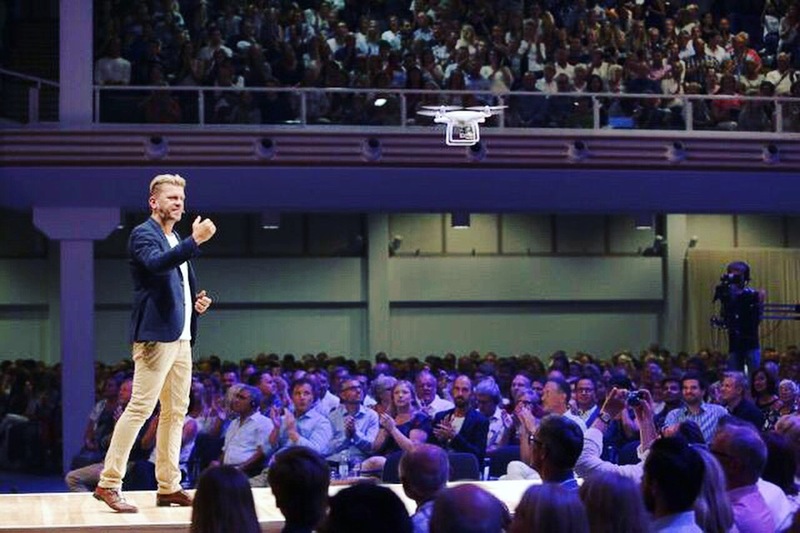 During the last night of our Europe conference, we shared the news that Word of Life has become partner in a project, aiming to distribute electronic Bibles using 10 feet drones to areas in the Middle East that could not be reached in any other way. The drones have the capacity to drop large amounts of specially designed electronic devices with a display, just a little bigger than a matchbox, which provides access to the entire Bible and help to understand its basic message about Jesus Christ. – What is the purpose of the project? Ever since the invention of printing, Christians have been involved in sharing the good news of God’s love, grace and salvation, by producing, translating and distributing Bibles. The first priority has always been to share the message with people and areas that have not yet heard the message, or with those living under oppression, persecution and in areas where basic human rights are denied them. In the Middle East, and especially in Iraq, a spiritual awakening of historical dimensions is taking place. In these past few years, millions have turned to the Christian faith in what can only be described as a wave of revival, far beyond anything previously seen. What our new brothers and sisters in Christ lack, however, are Bibles in their own language, that allows their newfound faith to take root, grow and become a source of strength, hope and perseverance in the midst of a situation that is characterized by so much oppression and suffering. This is the need we aim to meet with this project. Today’s technology has given us a unique chance to make God’s Word available and accessible to areas we would not otherwise be able to reach. To not use this opportunity would be betraying our own Christian history, full of men and women who gave their entire lives to translate and make the Bible accessible to a new group of people, as well as turning our backs on millions of new brothers and sisters in Christ that cry out for Bibles more than anything else. Some media has described the project as a ’Bible attack on ISIS’. This is completely untrue and an expression of the media’s constant search of anything sensational and spectacular. This is not a political statement, nor an ’spiritual counter attack on terrorism’. What we want is to make the message of Gods love available to people who need it and long for it the most. – Who are Word of Life’s partners in the project? Without naming names, we want to emphasize that our partners are very knowledgeable and well versed in the region’s terms and conditions. This is not a wild idea from a church far away from the reality of the Middle East, but a well thought out, efficient and carefully prepared project that we have had clearly described to us, and have chosen to support. In the long preparation process of finding technical solutions, financing, permits and other things required to implement the project, a series of genuine miracles have occurred. We see in this God’s own desire to reveal to people who He is, and to provide comfort, hope and strength to those who suffer. Our most important partners are, of course, all the Christians from around the world who stand with us in prayer for the project and for the particular situation the Middle East is in right now, and with large and small donations that will enable us to provide some of our most vulnerable brothers and sisters with Bibles. – Could a project of this nature create problems for the Christian population? All dimensions of the project and its effects are taken into account, and the aim has been to act with great care and responsibility. Our partners from the area are very aware of any challenge and are working hard to make sure the distribution of Bibles is done in the best possible way. Having said that, let me underline again: it is the Christians in the Middle East themselves, that cry out to us for Bibles. They know, more than anyone, all about the risks of standing up for their newly found Christian faith, but still desire, more than anything, the opportunity to read God’s word and grow in their faith. From a secular Western World perspecitve, where a high quality of life is the highest goal, this may sound incomprehensible. But everyone who has studied church history know that the Christian faith has not been eradicated in times of trial and persecution. Quite the opposite. The best expression of our love and care for our brothers and sisters in the Middle East, is to keep them in our praters and grant them what is the number one wish of so many: being able to read a Bible of their own. – Why did you go public with the project? In consultation with local organizations, we chose to use the same policy as the other partners of the project: to share about its fundamentals to raise awareness and encourage prayer and support for it, but without any mention of the exact details, specific areas where it will be implemented, etc. In our brief presentation of the project, we made an effort to keep the information on a balanced and responsible level. We ourselves have never spoken of ISIS or used spectacular expressions such as ’air strikes’ at all. As the media pasted the names of the project, we have published clarifications on our website and Facebook, and have contacted newspapers, asking them to change their formulations. – Isn’t it more important to give food and clothes to those who suffer, rather than Bibles? Word of Life wants to be a church where we look at the whole person and all her different needs – where nothing is too small and nothing too big. Ever since the refugee disaster escalated a year ago, we have been involved in everything from sending trained medical teams for medical interventions in refugee camps, to providing help for traumatized refugee children in camps and detention centers. We have sent a number of volunteer teams to Greece with the purpose of giving refugees arriving to Athens clothes, food and medicine. We collaborate with the authorities on a national, regional and local level around the welcoming (reception) and integration of refugees in Sweden.. We have collected and distributed tons of food, clothing and materials to help the needy, and work in every way and level to provide people with the help they need. The use of drones to drop bibles into closed areas in the Middle East is far from the only thing we do, but it is not the least important. The message that is dropped from heaven is no radical political statement but a one about a love, peace and forgiveness that encompasses and includes all people. A message of God’s love – the only guarantor of the peace and reconciliation that this part of our world so urgently needs.